OK, let’s get to the point here. We’re not going to tell you how ICO boomed in 2017 to early 2018. And we’re not going to stress on how billions of dollars were raised during that period of time. We’re just going to give you a simple comparison on the two models, from the point of view of an investor. Simply put, unlike ICO (Initial Coin Offering), IEO is not open to the public. You’ll have to be a user of the hosting exchange to participate in the token sale. While ICO allows any contributors to buy the token for sale by sending funds into a specific address, IEO requires contributors/users to buy the token with the exchange’s accounts. Isn’t ICO supposed to be better? Putting all other factors aside, maybe. As the model is open to everyone in the public, it allows the project team to raise more capital, theoretically. But wherever the money goes, frauds and scams cannot be far behind. This is also one of the biggest reasons why ICO cooled down in the past year. Scammers exploited the opportunity to raise funds without delivering the promised technology. Is Initial Exchange Offering the Old Wine in a New Bottle? No. The biggest problem with ICO is that it is not monitored by any third parties. Basically, anyone can launch an ICO, as long as you have a white paper to convince investors to put funds to your company. On the other hand, IEO is a very, if not entirely, different model. While both ICO and IEO share the similar rationales of Initial Public Offering (IPO). In an IEO, an exchange is an administrator. To conduct an IEO, the project team must meet and comply with the exchange’s requirements in order to launch the token sale. Contributors are, therefore, protected by the exchange. Although some may argue that the exchange may go along with the project team to scam customers, this will put the exchange’s reputation at risk. Any exchanges that look for a sustainable business model would not consider taking such an unethical move. 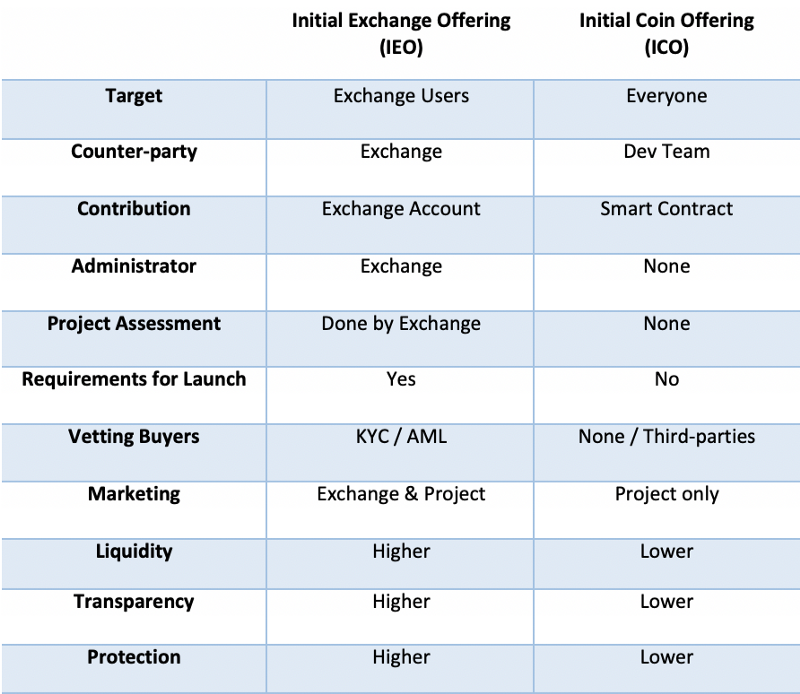 Instead, the exchange is risking their credibility when doing IEOs, since it has no control over the IEO project team’s operation and product delivery as promised in the latter’s white paper. To maintain trust with its customers, the exchange must carry out a comprehensive assessment of the project before launching the IEO. This provides an extra layer of protection to contributors. Comparing to ICO, the risk of IEO is much lower for both the project team and contributors. On the customer’s side, not only will the exchange help them review the projects and filter out scams, but it also provides better liquidity for trading afterward as a large user base is already guaranteed. The exchange will also offer a convenient platform for contributors to manage their funds as all assets can be stored in the exchange account instead of different wallet addresses. For project teams, they are eased of operational hassles. For example, all the exchange users have been vetted by the exchange’s KYC / AML verification. The exchange will also provide liquidity with its user base, and also help on marketing promotions. With all the scams and frauds out there, an IEO is no doubt a better model to the contributors/customers. Despite more processes required for both project teams and contributors for the token sale, the extra protection offered is worth the cost. For months we’ve prepared and kept test-running our IEO platform. Now, we’re proud to announce that our IEO platform, OK Jumpstart, will be launching very soon. We aim to incubate high potential projects and support early entrepreneurs with this new platform. By saving the time and resources for getting listed on exchanges, project teams will be able to focus on project development and community management. More details about OK Jumpstart will be announced shortly. Please stay tuned for updates. For any inquiry about OK Jumpstart, please email to [email protected].